In the News: Is your meat fabricated from drugs or grown from food? Walmart just started airing an ad as part of its “Steak-Over” series. Filmed at CU’s Folsom Football Field, the ad shows Buffalo fans first lauding some steaks hot off the tailgate grill and then being surprised to learn that they came from Walmart. 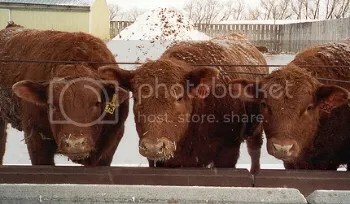 One doctor of animal science reported seeing cattle walking down a truck ramp tippy-toed when usually they just run down the ramp and jump out. Weight gain supplements are the suspected culprits. As year after year of severe drought drove corn prices to record highs, “the margins got extremely squeezed in our business,” explained Gerald Timmerman, a third-generation cattle rancher and feeder. To continue earning profits despite higher input costs, cattle feeders turned to beta-agonists as a cheap way to put pounds on cows. These drugs, originally designed to alleviate asthma symptoms in humans, were morphed into weight-gain supplements over the last decade. And it’s easy to see why. They can add 24 to 33 pounds to an animal’s final weight by stimulating the growth of lean muscle instead of fat. I don’t know where Walmart sources its meat. Perhaps from happy, pasture-raised cows. But economics is a pretty rigid discipline. If input costs go up, something has to give. If the end price to consumers remains a great value, you must question what happened in between, in the production phase. As smart consumers, why not start asking questions and demanding more–and be ready to make some hard choices for better meat.